Despite this advancement in gender justice, continued imbalances regarding representation, access, enforcement, and implementation remain. The disproportionate representation of women at major legal organizations and the ratio of female judges on international courts and tribunals such as the International Court of Justice (of the fifteen current judges, three are women) and the International Tribunal for the Law of the Sea (three of the twenty-one judges are female) are a stark reminder of this imbalance. In celebration of International Women’s Day on March 8th, we reflect on the representation of women in law, the progression of women’s legal rights, and the gender imbalances still hindering access to justice today. The origins of International Women’s Day rest in feminist protest – against labour discrimination, in pursuit of suffrage, and in campaigns for peace. International Law, today, holds many tools, from The Convention on the Elimination of All Forms of Discrimination against Women to Security Council resolution 1325, to guarantee rights for women and yet we know that gender remains a site of multiple oppressions globally. International Women’s Day asks us to remember the transformative power of feminist protest as a means to change international law for the better, to remember the Women’s Peace Congress of 1915 and to listen to transnational feminist organisers across communities to articulate new areas for legal change. In 2015 as part of the Sustainable Development Goals the world committed itself to achieve gender equality. The Sustainable Development Goals were a result of a UN-led process, involving its 193 Member States, which committed the world to 17 goals as part of its 2030 Agenda for Sustainable Development. The objectives are far-reaching: to end all discrimination and eliminate violence against women and girls; ensure full participation in decision-making; and achieve universal access to reproductive rights. All this by 2030. Particularly important is a commitment to recognize and value unpaid care and domestic work. Women still spend three times more time on unpaid work than men, precipitating many into precarious, low-paid work, or reliance on other, poorly-paid women. For the poorest women, inadequate housing and lack of electricity and water intensify the struggle. The Sustainable Development Goals specify four areas for improvement: public services, infrastructure, social protection policies, and shared responsibility within the family. Achieving gender equality and the empowerment of all women and girls will not happen easily. This requires a concerted effort from all levels of society. We cannot allow governments to reach 2030 without fulfilling their promises. With three years already behind us, we need to work together to ensure that everyone is included. In 2014, the US Board of Immigration decided that women fleeing domestic violence were entitled to seek asylum if they had been unable to escape their marriage or get assistance from police. In June 2018, Attorney General Jeff Sessions declared that women couldn’t claim asylum in the US on the basis of domestic violence, arguing that they did not constitute a “particular social group” and that domestic violence was “private criminal activity,” not persecution by a government. Responding to an ACLU lawsuit, in December 2018, federal Judge Emmet Sullivan struck down the Sessions policy, arguing that domestic violence victims seeking asylum in the US qualify for “credible fear” interviews, where they can make the case that their government was “unable to protect them from violence.” International courts have reached similar conclusions. The European Court of Human Rights has learned to regard domestic violence as a violation of women’s human rights, even though such violations result from the state’s failure to safeguard women’s rights, not from state persecution. These violations are harder to see, but crucial to recognize in order to protect women’s right to live free of violence. 2019 marks forty years since the Convention on the Elimination of all Forms of Discrimination Against Women was adopted, but are we really any closer to equality? The theme for International Women’s Day 2019, is “Think equal, build smart, innovate for change”, but are lawmakers thinking equally when it comes to safeguarding women’s rights on domestic violence, healthcare, unpaid work, and maternity leave? Are legal institutions willing to innovate and re-build to address the gender imbalance in female representation? International law is an essential instrument in the battle for gender equality, but how can we ensure that international laws will be interpreted and implemented consistently across the globe, so that no woman or girl is left behind. Featured Image Credit: “#MARCH4WOMEN” by Giacomo Ferroni. Public domain via Unsplash. Gina Heathcote is a Reader in Gender Studies and International Law at SOAS University of London, and the author of Feminist Dialogues on International Law: Success, Tensions, Futures. Sandra Fredman is Rhodes Professor of the Laws of the British Commonwealth and the USA at Oxford University, and the author of Comparative Human Rights Law. Valerie Sperling is Professor of Political Science at Clark University. 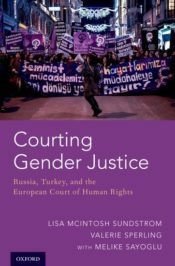 They are the authors of Courting Gender Justice: Russia, Turkey, and the European Court of Human Rights.